I made our little friend, Miss Bean, this marker case for a gift recently. She has just begun to develop an interest in drawing and coloring--her most memorable work to date being the drawing she made on her bed sheets with markers. Okay, so maybe a gift of more markers was not the best idea but who am to quash early attempts at textile design? 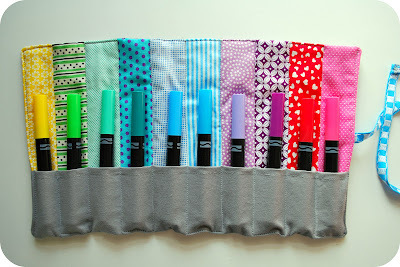 The marker roll I made for her was adapted from the design in Last-Minute Patchwork + Quilted Gifts by Joelle Hoverson--the design in the book is made for colored pencils so I just doubled the size of the pencil slots so they could accommodate the width of a magic marker, and then made it to fit the number of markers my set contained. 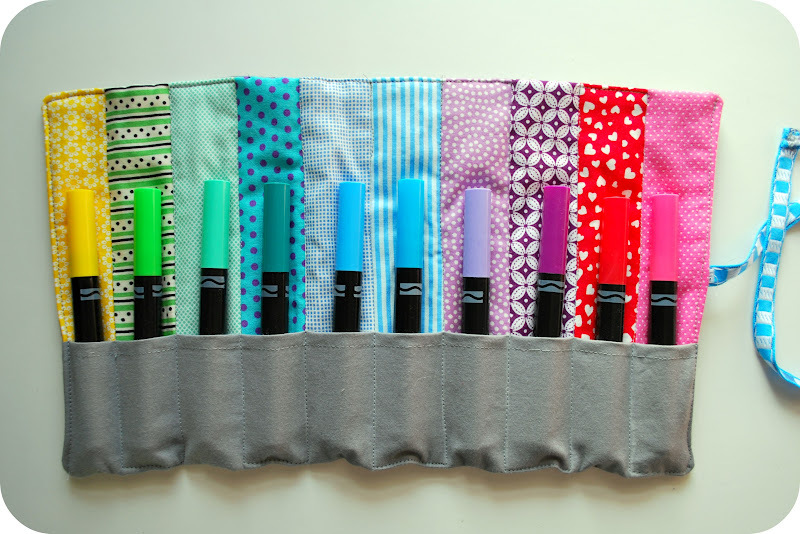 I really like this pencil roll design--I have made it several times and I think it always turns out eye-gogglingly lovely. It instantly elevates art supplies to being an extra special gift. The coloring book, Squiggles by La Zoo, is one Beeper loved when he was Miss Bean's age and is perfect for the preschool set. When I gave it to Miss Bean, she readily got to work practicing her squiggling technique at the front of the book, then moved onto squiggling some very colorful spaghetti on the plate image further in. 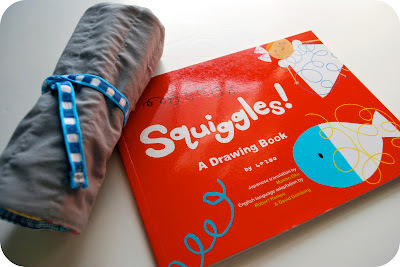 Squiggle on, little friend--just not on the bed sheets, please. Ohhh such a great idea! I was wondering how old miss bean is? I was thinking of the book for my nephew that is turning three - not having seen the book in person, does that seem like an appropriate age? Thanks! 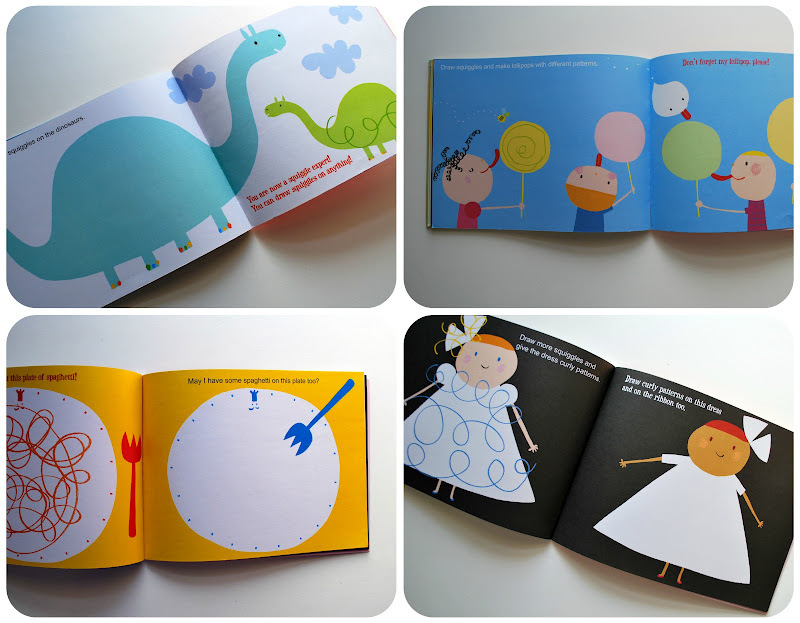 Heather, Miss Bean is 3 years old too--and this is the perfect age for this book. Works well for the 2-4 year old range, I think. So Cute! I think it would be a great addition to my son's easter basket. Thanks so much - birthday gift solved! I giggled at the "early attempts at textile design"
I bought 4 LaZoo books for my 9 y.o. who is autistic. Thanks for the tip!